Xun Shou refers to the patrols dispatched by the emperor to inspect the land areas guarded by dukes or princes in ancient China. As an ancient imperial inspection activity outside the capital, it originated very early. A Study of Xun Shou in Pre-Qin Period explained the origin and development of Xun Shou, and explored the cultural system behind it. 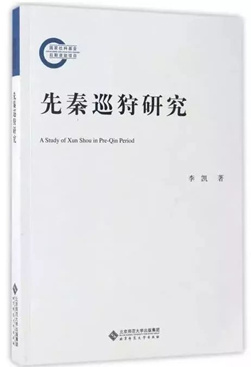 It outlines the overall condition of the pre-Qin Xun Shou and analyzes the laws of political life in the ancient times, which is important to understanding the social features of ancient society and early development of imperial power. Xun Shou played an important role in the social order in ancient times in the following aspects: It provided supervision over industries that are closely related to the national economy and people’s livelihood within the country; it is the most effective way for the emperor to promote the ruling system; it is a personal way for the emperors of early dynasties to inspect his liegemen; it helps promote the military control exercised by the Central Plains over faraway areas; it is a way to strengthen and show off royal power; it is an important means to sidestep local blood ties and promote economic and cultural exchanges between different regions; it is a necessary way in which the emperor understands the social ethos and opinions of areas with relatively backward social conditions. In short, Xun Shou helped maintain the stability of early nations. China’s early countries were more primitive than the mature countries after the Qin and Han dynasties, with vague ideas about national boundaries and territory, imperfect development of the bureaucratic system, low productivity, and lack of unified cultural identity. Under such social background, Xun Shou “made the nation’s greatest attempt to mobilize manpower and force, create and consolidate cultural identity, and promote political ties to replace kinship. It was an important way for the early countries to transit to a mature country.” In this light, Xun Shou was the political act that radiated to the areas all around through the center of the city states, and the contents covered political, military, and religious aspects. Through Xun Shou, the book reveals the “changes” and “normality” in the development of the pre-Qin political civilization. On the one hand, we see “changes” in the “normality.” From a macro perspective, the development of Xun Shou in the pre-Qin period reflects the general trend of social change in the Shang and Zhou dynasties and even in the Qin and Han dynasties. The development of Xun Shou during the Shang and Zhou dynasties was a transition from a clan state to a geographical country. In this process, the kings grew from the head of the feudal princes to their monarch, and the dynasty’s government had different control over the princes of each country. In addition, many differences in monarchical rites and Xun Shou activities between the Qin and Han dynasties and the pre-Qin period reflected the different socioeconomic conditions and national structures of different dynasties.